THE NEW TOURISM POLICY – WILL IT WORK? President Mkapa has made an auspicious start to his Presidency. Almost everyone is now aware, because of the many actions that he is taking, that there is a new administration in Tanzania. People are said to be working again. Newspaper readers have been seeing headlines such as ‘President-Premier Appear Like a Tough Double Act’, ‘Foundation Has Been Set’, ‘A Sure Touch in Tanzanian Foreign Policy’, ‘A Fair Start’. But not all is well. The state of the economy is still very gloomy and there is a crisis in Zanzibar. Parliament on the mainland under the new multi-party system has got off to a good start. Members of the government and opposition parties attended an instructional seminar together and, at the first brief session of Parliament members of all parties were appointed to parliamentary committees. Speaker Pius Msekwa has favoured opposition MP’s in time allocations for speeches which has contributed to a state of harmony. In Zanzibar, by contrast, the opposition Civic United Front (CUF) boycotted the Assembly and refused absolutely to recognise the Chama Cha Mapinduzi’s (CCM) Dr. Salmin Amour as President. President Mkapa’s appointment of a new and ‘clean’ group of Ministers to his cabinet (TA No. 53) proved very popular but must have upset many of ‘the old school’ in his CCM party who now have much less influence as they sit ‘on the back benches’ of Parliament. President Mkapa’s modesty has also been widely welcomed. He has indicated that he does not want to be addressed as Mtukufu or ‘Revered Person’, does not want his photograph on currency banknotes and does not wish to be on the front page of newspapers when all he has done is to send greetings to other Heads of State. The President knows however that the success of his presidency will be determined by the way he tackles corruption and the economy. As part of the new policy of transparency, following the publication of a list of his assets by President Mkapa (TA No. 53) Vice-President Dr. Omar Ali Juma has declared his. They comprise a four-roomed house in Mpendae which he started building in 1978 and part of another family house in Pemba. He was in the process, he said, with his wife, of building a house at Kiembe Samaki; he has an undeveloped plot at Mazizini given him to him by the Zanzibar Government, a six-hectare farm and Shs 3 million in banks. Other leaders are declaring their assets but these have not yet been published. On January 17 the President appointed a nine-man Task Force under the Chairmanship of former Prime Minister Joseph Warioba to look into the whole area of the law, rules and regulations, and the government’s and the public sector’s working systems in order to better fight corruption. The team was instructed to report back to the President within nine months. Critics of this move have pointed out however that some members of the team have questionable qualifications, that no members of the opposition were included and that setting up a committee is not the way to tackle corruption. The long-standing deportation order against controversial businessman V G Chavda (the case about which former Deputy Prime Minister Augustine Mrema left the government) was finally carried out in January 1996 and Mr Chavda left the country. He was alleged to have been the principal culprit in the misuse of $3.22 million of Debt Conversion Funds. So much determination is being shown in revenue collection after the 1995 scandal (TA No. 52) that many businessmen are complaining of undue harassment by tax inspectors. Transport operators have been reminded that they must not issue travelling tickets to Tanzanians if they are not in possession of a tax clearance certificate. There are signs of renewed devotion to duty by customs officers after ten were compulsorily retired. Strict monitoring of transit cargoes is making it more difficult for owners to evade customs duties. During a recent tax compliance exercise 16 trucks and 50 taxis were seized. Checkpoints have been reinforced to stop the unloading in Tanzania of goods destined for elsewhere. A revamp of the much-criticised Investment Promotion Centre is under study by a newly appointed 12-person team. Prime Minister Frederick Sumaye gave big debtors of the National Bank of Commerce, who owe the bank some Shs 184 billion and have brought it to the edge of bankruptcy, one month to reconcile their accounts and agree on terms for the settling of debts. In a situation in which 98% of Tanzania’s gemstones are reported as being smuggled out of the country the government suspended gemstone mining in certain areas and banned charter planes from landing near the mining fields so as to give it time to complete new procedures for gemstone sales. There area also indications of a much tougher line on public appointments than Tanzania is accustomed to. On January 8 it was announced that the Chairman of the Tanzanian Licensing Authority (TLA) Mr Juma Mkama had been relieved of his post and seven other TLA officials had been transferred to other departments. On March 13 President Mkapa took his boldest step yet when he ordered the reconstitution of 19 Boards of Directors of state-owned financial houses, corporations, agencies and authorities and said that he wanted to streamline their operations and enhance their efficiency. And on March 26 he announced that he had revoked the appointments of the Chief Executives of the Pyrethrum and Tobacco Boards and the Tea Authority also. On April 1 the Minister of Finance appointed new commissioners to head the three main taxation departments in the Ministry – Income Tax, Customs and Excise and Sales Tax and Internal Revenue University Professors have been appointed to chair the National Bank of Commerce (Prof. Haidari Amani, an economist) and the National’ Insurance Corporation (Prof. Josephat Kanywanyi, a Lawyer). The Daily News reported on March 18 that the Director General of the Capital Development Authority had been suspended. On the economy, a major step forward was the announcement on March 19 by the IMF that it had reached agreement with Tanzania on an economic monitoring programme. This would determine if Tanzania’s performance warranted the release shortly of Structural Adjustment Funds of $200 million which were frozen last year following revelations about extensive tax evasion. 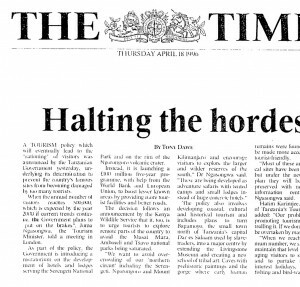 In anticipation of this, foreign aid has begun to flow again. Sweden has granted $7.7 million to help Tanzania pay part of its debt to the World Bank. Tanzania’s total external debt is $6,800 million. Norway announced in January that it would release 50% of $7.2 million balance of payments support allocated for 1995. The remaining 50% would be released after the implementation of sound budgetary practices. Japan has made a grant of $19.6 million for import support and road maintenance and Britain has granted £4.25 million for balance of payments support. President Mkapa has been widely praised for his success in bringing together the previously quarrelling Presidents of Kenya and Uganda and thus enabling the new East African Secretariat to be officially launched at a big ceremony in Arusha on March 14. Observers noted however that there were many less Tanzanian businessmen at the celebrations than those from Kenya and Uganda. The latter clearly expect to benefit from any trade liberalisation which might follow from this new spirit of East African Unity. The four-party opposition in the Union Parliament (TA No. 53) has entered into the spirit of multi-partyism and achieved some success in causing the government to make changes in its January 1996 mini-budget; it has also strongly attacked the National Intelligence and Security Agency for ‘operating illegally and harassing people’. At the beginning of Parliament’s first session it faced a problem because of its composition. According to the rules, for an opposition to be recognised as such it has to have at least 30 MP’s. The main opposition NCCR-Mageuzi had only 19 and was put out when the 28 CUF MP’s, all from Zanzibar, joined with the four UDP members from the mainland and established a shadow cabinet under the leadership of CUF’s Mrs Fatma Maghimbi. There is logic in the new opposition alignment however because the CUF and UDP would be regarded in Western terms as ‘right of centre’ whereas the NCCR is clearly on the ‘left’. The ruling CCM party is vague in defining its new political ideology but the word ‘socialism’ is rarely heard nowadays. Meanwhile the opposition NCCR-Mageuzi, CHADEMA, TADEA and TLP parties are all facing internal tensions connected with leadership disputes or the use or misuse of funds provided by the government for election expenses. Ubungo (Dar es Salaam) NCCR-Mageuzi MP Dr. Masumbuko Lamwai and NCCR Executive member Prince Bagenda are said to be preoccupied with the choice of party presidential candidate for the year 2000 while NCCR Leader Augustine Mrema is trying to persuade the party to concentrate on more important issues. * Includes Attorney General and five Zanzibar House of Representatives members. Some 134 petitions to courts against the election results, which threaten the position of several cabinet ministers, had been whittled down to 66 by early April after the dismissal of the first three cases with costs. As this issue of ‘Tanzanian Affairs’ went to press, election petition cases had started against Minister of Natural Resources and Tourism Dr. Juma Ngasongwa, Ukonga (Dar es Salaam) CCM MP Paul Rupia and Temeke (Dar es Salaam) CCM MP Ally Kihiyo. While multi-partyism on the mainland is working well the political crisis in Zanzibar arising from widespread scepticism about the recent election results, age-old differences between communities, economic factors and personality clashes between the main protagonists grows worse. Dr. Salmin Amour was declared elected as President of Zanzibar by the Zanzibar Electoral Commission by a majority of 1,565 votes (out of a total of 328,977) but the vast majority of his votes came from the main island Unguja. His CCM party was unable to win a single parliamentary seat in the island of Pemba. Geir Sundet’s paper referred to above quotes from another detailed analysis of the election results (Republic in Transition; 1995 Elections in Tanzania and Zanzibar, International Foundation for Election Systems, 1101 15th St. NW Washington DC 20005) which states that in the controversial election in the Mlandege constituency in Unguja, international observers found that while the official result gave CCM victory by 871 votes a recount indicated a victory for CUF by 17 votes. Mr Seif Shariff Hamad’s Civic United Front (CUF) won every seat in Pemba with ease. However, had Mr Hamad been declared elected as President, a similar crisis could have arisen given the equal support and determination to win of both sides in the contest. Mr Hamad however might have taken a less rigid stand than is now being taken by the tough President Amour. For outsiders (and large numbers of Tanzanians including Father of the Nation Julius Nyerere) the obvious solution for Zanzibar would be a government of national unity. But President Amour continues to insist, quite correctly, that in a multi-party system the one who gains the most votes wins the election and is therefore entitled to rule. The President has made his position quite clear on several occasions. At a rally on March 17, which was organised to protest against acts of sabotage (see below), he said that the Zanzibar Government would never hold a dialogue with CUF and there was no need to form a government of national unity because CUF leaders ‘did not have good intentions’… There was no person inside or outside Tanzania who would force the Government to have dialogue. There were external forces using the opposition as camouflage to recapture Zanzibar. At another very large rally on March 26 he stated that he would not resign despite the bad press he was getting from tabloid newspapers. ‘CUF shall never accept Dr. Salmin Amour as President of Zanzibar. He was never elected. He, in cooperation with the Chairman and members of the Zanzibar Electoral Commission, imposed himself as President. We do not buy the idea that Dr. Salmin should incorporate two, three or even five CUF members as members in his own government … because this would undermine the whole democratic process ….I CUF offers two options in tackling the problem. First, the ‘Haiti option’. Dr. Amour . . . must be pushed to step down and the person undersigned who won the election should be installed as the lawful President of Zanzibar … I promise to form a government of national unity. The second option is that Dr. Amour steps down and an interim President, a person of high integrity, is appointed. The President should review the Zanzibar Constitution and the Election Act….and organise a new election within three months.. ..I – Seif Shariff Hamad. The division in voting preference between the two islands was further reinforced on March 31 when in Ward (local government) elections (with very low poll turnouts) CCM won all 17 seats in Unguja, the main island, and CUF won all six in Pemba . Well known Zanzibar journalist Salim Said Salim, just before he was prevented by the government from continuing to operate as a journalist in Zanzibar (which aroused much criticism outside the Isles), wrote an article in the ‘Business Times’ in which he spoke of President Amour’s ‘revenge1 against Pemba where his CCM party had scored only 10% of the votes. He noted that President Amour had appointed only one Minister from Pemba in a Cabinet of 18, one junior minister out of five from Pemba, one Pemban Principal Secretary out of 14 and one Pemban Deputy Principal Secretary out of 21. He then appointed four Regional Commissioners, all from the main island of Unguja. He had previously broken the unwritten rule that, if the President comes from Unguja the Vice-President should come from Pemba. Both now come from Unguja. Zanzibar’s House of Representatives is operating with difficulty as all the 24 CUF representatives are boycotting its proceedings. In this situation isolated acts of violence, arson and sabotage began. Some people from Pemba resident in Unguja complained that they have been harassed and intimidated and some are said to have fled to Pemba. In Pemba itself the Daily News has reported a number of incidents. Two petrol bombs were thrown at the Zanzibar House of Representatives Hall in Wete on January 28. A primary school was set on fire on February 1. Some 8,000 secondary and large numbers of primary school pupils are reported to have been engaged in a strike since January. Faeces are said to have been smeared on the walls of two schools to discourage any return. On February 3 a secondary school laboratory was set on fire. A CCM supporting businessman in Pemba has had his godown burnt down as a ‘punishment for backing the wrong party’. On February 29 the house of the CCM Assistant Secretary for Pemba South was set on fire. On March 3 some 400 people attacked three security officers, their vehicle was destroyed and their weapons were stolen. More seriously, at the beginning of April, saboteurs severely damaged a marine cable bringing electricity from the mainland and the main electric plant which resulted in a four day power blackout in Zanzibar and severe water shortages. The government has reacted firmly to the unrest. It detained three opposition representatives in Zanzibar’s parliament for holding illegal meetings and inciting students to strike. They were later released following pressure from the courts. 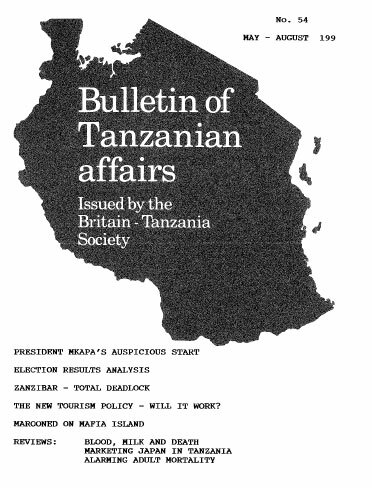 The Government has been widely criticised for banning the Dar es Salaam newspaper ‘Majira’ from Zanzibar for articles the paper had published which were said to have ‘lowered the reputation of the Isles’ government and its leaders and exposed them to ridicule’. One man was fined when he was found with a copy. Well-known Zanzibar journalist Salim Said Salim was banned from writing news articles while in the Isles because he was said to have been writing anti-government statements ‘aimed at disrupting peace and national unity’. As we go to press the Daily News reported a brief police raid on the residence of Seif Shariff Hamad. Union Prime Minister Frederick Sumaye said on February 2 that the government would not allow Zanzibar to slide into bloodshed and violent political hooliganism. He reminded the people of Zanzibar how, in Angola and Mozambique, people had refused to accept election results and then been plunged into two decades of civil war. Zanzibar-born OAU Secretary General Salim Ahmed Salim said on January 9 that his position was being made more difficult because, as a Tanzanian, he derived his strength to negotiate other nations’ conflicts because of the peace and stability obtaining at home. “The two sides must sit down and talk to each othern1 he said. Zanzibar Chief Minister Dr. Mohamed Bilal stated on February 1 that he had ‘irrefutable evidence8 that foreign embassies were fuelling the political crisis in the Isles. The East African reported on April 22 that Norway had suspended aid worth $4.5 million to Zanzibar in evident disapproval of the elections and the ‘heavy-handed attitude adopted by the ruling regime since then’. The suspended aid was for the island’s electrification programme. Canadian High Commissioner Mrs V Edelstein has expressed disappointment at the performance of the Zanzibar Electoral Commission and said that Canada remained concerned about the irregularities in the Zanzibar electoral process. “The issue should be resolved through dialogue” she said. US Ambassador to Tanzania Brady Anderson has said that claims of vote-processing irregularities were a matter of grave concern to Washington. “Very serious questions remain about the way in which the votes were counted and the results announced”. President Mkapa must be embarrassed as he is constantly questioned about what he is going to do about Zanzibar. He invariably replies that people should accept the election result and that he has no constitutional authority to act. His predicament is exacerbated by divisions within his own CCM party. On the mainland, a group of formerly powerful CCM leaders fully support President Amour’s position. Former Prime Minister John Malecela has stated that threats by CUF to remove President Amour represent treason. Similarly, as Mzee Hashim Ismail pointed out in an interview in the Sunday News on March 3, the ‘old CCM revolutionaries’ in Zanzibar, many of whom hold no official position but do have privileges, have little liking for democracy. Other CCM members on the mainland are said to be unhappy about the whole situation. Mzee Hashim Ismail went on to say that CUF should realise that Dr. Amour has the guns, the police and the army, even though CUF appears to have the moral support of people inside and outside the country. CUF should get into the House of Representatives and fight from within, he said, just as Mwalimu Nyerere did at the time just before independence when the British government offered him only five seats in the Tanganyika government. Nyerere fought for more and eventually got them. As usual when there is a crisis in Tanzania people tend to look for help to Father of the Nation Julius K Nyerere. At present he is very busy mediating the conflict in Burundi, Perhaps he now needs to go to Zanzibar – DRB. Pupils at the Leys High School, Redditch, Worcestershire faced some tearful prospects in the autumn of 1995. Some of the students had taken part in an onion growing competition called ‘Greenfingers’, to find out who could grow the largest and heaviest onions in their gardens. The project was initiated during a visit of Mr Mustapha Ulaya from Saba Saba Day Secondary School in Mtwara. He was one of four teachers who visited Redditch in April-May under a twinning link between the two schools. The Greenfingers project was initiated, not only as a means of encouraging gardening skills, but also to identify in a practical way with pupils in the partner school in Tanzania. For some pupils, the reality of a dry summer and hosepipe ban resulted in a negligible crop but also a clearer understanding of the problems of drought in Africa. A year 11 pupil, Ian Jeanes, won the competition with his three largest onions. All the harvesters were awarded some chocolate ‘onions’ by courtesy of a local factory and a certificate signed by Patrons, Nick Houghton, Manager, ‘Where Next Nurseries’ and ‘fellow gardener’ Sir Cliff Richard. David R Morgan, community Tutor, Leys High School. We have been asked to inform readers that Voluntary Service Overseas is looking for more than 10,000 people who volunteered with VS0 in the last three decades and have lost touch with the organisation to make themselves known in connection with a planned massive 40th birthday party. Contact Tel. 0181 780 1349 – Editor. “If this is paradise I’d rather be in hell”. An exaggeration perhaps, but by then we all shared something of George’s sentiments. We were sitting under the corrugated iron verandah of the Bismillah Guest House on Mafia Island watching torrential rain hammering at the steaming jungle. The four of us, on our Easter break from teaching in the Kilimanjaro Region, had arrived five days ago. A gruelling journey in a tiny wooden cargo boat from Dar had brought us there. But with no sign of any return voyage, we were beginning to wonder if we would need a miracle to take us back. Mafia has acquired near legendary status among travellers, since so few manage to get there or so the guidebook said. That was the bait. Hooked by this promise of adventure, we had spent an afternoon in Dar es Salaam docks, clambering from dhow to dhow in the pouring rain. Eventually we found a compliant captain. Bedded down on sacks of cement in the hold, we chugged out into the Indian Ocean at first light. An angry wind and saw-toothed sea had turned what should have been a days journey into a 50-hour ordeal. When at last we sighted land, 1 could have sung. My first sight of Mafia was at dusk. Between the grey of the torpid sea and the immense thundercloud sky, there was a ragged fringe of green. Dense jungle blanketed the island, sprawling right to the sandy shore. Dead ahead, pinpricks of lantern lights glimmered in the twilight. We drew near, and a cluster of squat huts like a smugglers nest emerged from the gloom on the shoreline. There was no quay, so we weighed anchor among the dhows at rest in the bay, and waded waist deep to the beach. A modest crowd had gathered. Ragged young kids scurried between the groups of older youths, their shrieks swallowed by the sea and the forest. The youths were silent, watching the boatmen and us. We pulled on our trousers over wet legs, grabbed our packs and trudged up a sandy track cut through the jungle. We had reached Kilindoni, the largest settlement on the island. Kilindoni is one side of Mafia. For the first couple of days we were content just to slip into the rhythm of the place, and not to worry about getting home. Our room in the run-down Bismillah Guest house was tiny, with one single bed so we’d take turns to sleep on the floor. The electric light didn’t work, and we’d wash in cold buckets of water in the cell-like shower. But in Kilindoni I found something of what I had been searching for in Africa. It wasn’t all beautiful or comfortable. Days were sometimes long, spent watching the almost incessant rain. But it had offered us a welcome. We would laze for hours on a wooden bench at a market stall. An unsmiling old man in a skull cap, with a leg disfigured to resemble an elephant’s, brought us cups of milky tea. We talked, but in different languages. It didn’t seem to matter. And we gobbled mandazi, the little fried dough cakes that are delicious when warm but sit like cobble stones in the stomach. For lunch Swahili women wrapped in vivid khangas served us rice and yellowy fish soup in plastic bowls. They cooed like mothers issuing us with spoons while the local lads who joined us simply rolled the sticky rice into balls with their fingers. The younger women, hair cropped and earrings flashing, breaking into huge gleaming grins when we turned to look. They wanted us to marry them and take them to Europe. Long evenings were spent at the beach. There the crumbling mud homes of the town gave way to huts woven from palm leaves. By day they were hives of cooking and eating. Tropical fish and rubbery squid were fried whole, and sold hot from trays by little children wandering the beach in silent orbits. Rice and tea was ladled out to fishermen returning from a mornings punting on elegant skiffs. At night it was still – the only movement the play of shadows on the sand cast by the cooking fires within and the twinkling of stars. There was one exception. A little hostel on the edge of town stayed open past midnight. Local men would gather and swap stories. We drank more tea and munched more mandazi, listening to the same Madonna album played on a tinny tape recorder over and over again. The four of us talked about everything we could think of. And we felt at home. Only after a few days did we begin to wonder how we were going to get back in time to teach. That was how we discovered the other side of Mafia. We ran into an English guy in one of the few bars. He was working on a conservation project on the other side of the island, and he fixed us a lift to take us to the lodge we’d heard about. Early the next morning we raced across the island in a fourwheel drive, taking the only road, little more than a rutted sand track. The jungle fringing the island subsided, giving way to marshes and patches of sandy waste ground. We splashed through streams, alive with the low trill of bullfrogs. Invisible birds hooted and tawny reptiles scuttled off the road. In the heat and wetness, Mafia was flourishing. In half an hour we had reached the Kinazi camp. It was a different world. A central club house and bar formed the hub, built in an African-hut style with thatched roof and ochre walls. But there was nothing indigenous. It was lavish and built to last. Smaller ‘huts’ were scattered throughout the lush tropical gardens, with neat paths and beds that cascaded stepwise down to the beach. And king of this little piece of paradise, was Ian. Wealth, like poverty, is impossible to hide. The hungry, but patient eyes of the boys on the beach would not soften if you gave them proper clothes instead of rags. Even if Ian had been dressed like Robinson Crusoe, it could not have concealed his aura of wealth. He smoked a brand of cigarettes called Winchesters and was in his early thirties. He was blond, with longish hair, a beard and blue eyes. His accent was South African, but he said the sea was his true home. We chatted a little awkwardly, conscious that we stood in his little kingdom by our own invitation only. In a few minutes of conversation, he conveyed the impression that he had seen and done it all. So we felt a little less like daring travellers, a little more like schoolboys. Ian owned the yacht in the bay. Three-masted and magnificent, it rested on the water like a little white gull. He also owned a plane, which he flew into Nairobi occasionally to pick up luxuries for his guests. The Lodge was his as were the beach huts, the immaculate tropical gardens, and every shimmering-leaved palm. An engine buzzed alive at the waters edge, and an orange launch loaded with whooping guests powered out into the bay leaving a white V spreading over the water. They paid one hundred dollars a night. Ian sent us snorkelling with one of his five dive instructors, and we spent a couple of hours exploring the coral reef in the cove, for a price. But as far as getting home went, our guess was as good as his. He pointed us in the direction of his neighbour, but warned us not to mention that he had sent us. By then it was late afternoon. Duke was having tea in the garden with two young men and a Scottish woman. We never quite worked out their familial relationships. After a tentative and apologetic entry, we were welcomed into their nascent gamefishing lodge. Kinazi was a different world. This was a different time. Duke was an Englishman in his late fifties, clad in khaki. He was a bullish Empire-builder, tough and domineering. We gathered that there was some rivalry between him and Ian. The two younger men, in their thirties and deeply tanned, had also seen a bit of the world. Rugby, game fishing and boats were their topics. The middle-aged and wiry Scottish lady lead the welcome, and told us to help ourselves to tea and mandazi. “Hamida, lete maji moto” ordered Duke. The hot water appeared, poured by Haida, a ghost-like servant girl. She did as she was told. I was rather pleased when Duke boasted that he could ‘knock-down’ the in-charge of the workmen who were laying the foundations of his challenge to Kinazi, but found that they would not compromise as readily as he had thought. We sat around the table in the garden drinking tea and wrestling. For conversation with Duke was like wrestling. He would pronounce. Our objections would be brushed aside, and then he’d jump on us. Malaria is nature’s method of birth control. AIDS is not yet quite as effective. Africa is doomed. But he had no solutions to our transport problems. We slept in damp foam in tents in the garden. The moon cast a shimmering path over the opaque waters of the bay, reflected in the Milky Way above. Palms danced in the sudden wind, a refreshing breath from the ocean. Waves caressed the sand. Magical is inadequate. The next morning we missed the daily run by the Kinazi truck to Kilindoni. In the hot light of day, it became clear that our brief liaison with the other side of the island had only been a flirtation. We crouched in the shade of an abandoned mud hut, and I meditated on the whine of crickets. After a couple of hours we flagged down a clapped-out Landrover, crammed with chattering islanders. I’d spent enough time in Africa to know that ‘full’ is a word only used by apathetic guest house proprietors. Transport is always fair game. We elbowed our way into the back, and I found myself in rather a compromising position with a young khanga clad woman who seemed oblivious to my embarrassment. It was hellish, but no worse than we were used to. We sweated, heaved and jarred. Elbows stuck into softer parts, necks craned, and still they chattered. For them, everything was as it should be. Biting curses or grinning sheepishly, we were the ones out of place. A lifetime of western comfort does not foster stoicism. Nor optimism. We crawled back to Kilindoni in an hour and a half, having failed to find a way home. The air was thick as if compressed by the weight of the thunder heads towering above us, and the vegetation seemed to sweat like we did. We reached the Bismillah just as the storm broke. Once more we found ourselves staring into the rain, watching rivulets then little streams of brown form a flowing latticework in the sandy street. Then George said what we were all thinking. It did feel a bit like hell. We escaped Mafia three days later. By then I felt half in love, half estranged. One day when the rain cleared, leaving the air humming under looming cloud, we had gone for a walk along the scimitar shaped beach. We wandered along it for hours, skin burning, feet scorched, squinting in the glare from the white sand and cobalt sky. I imagined the images we found there cut out and pasted on a billboard back home, advertising the Kinazi camp. The solitary palm curving over the gleaming sand, the lap of the tide. Only there would also be a beautiful girl luxuriating in the sand. Images can deceive. In truth it was one of the most desolate places I have ever experienced. We left Mafia as we had arrived – at dusk. By chance, the Canadian Spirit, a large passenger ferry, and cargo ship that plied the route from Dar es Salaam to Mtwara was picking up passengers from Mafia. It waited a couple of miles out, bright lights blazing over the water, like an alien presence surveying a primitive shore. The sunset was unearthly, a golden furnace raging behind the thunder clouds on the horizon. A launch sped us out across the water, and Kilindoni faded back to the pinprick it had been when we arrived. George was right, paradise it was not. But we had discovered something else. Half moth, half chameleon, we had flitted between two societies. But we were members of neither, and never could be. Such is the travellers delight. And such is his curse. A bold new five-year tourism programme involving investment of over $150 million was launched in Britain, at the Royal Geographic Society, on April 17 by Tanzania’s Minister for Natural Resources and Tourism, Dr. Juma Ngasongwa. 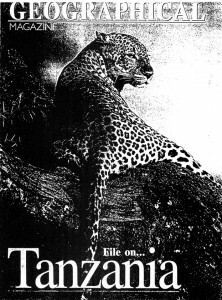 The meeting coincided with the publication in the Geographic Magazine (May 1996) of an attractively illustrated 16-page Supplement (Cover photograph by Gary J Strand of ‘Wildlife Explorer’) about Tanzania’s tourist attractions. 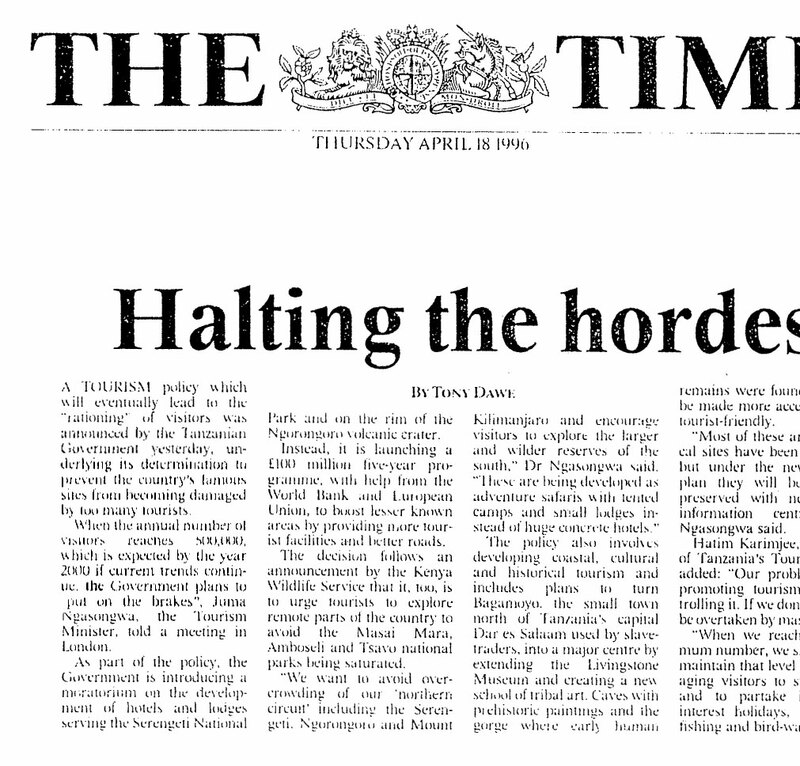 The next day the London Times publicised the event in an article under the heading ‘Halting the Hordes’ – see above. Tourist numbers, which, ten years ago, totalled only 50,000 and have now reached almost 300,000 are to be increased further up to half a million by the year 2000. However, after the year 2,000, a break will be put on further increase in numbers in a bid to create a ‘quality product’ and avoid overcrowding of parks and reserves and hence damage to the fragile ecosystem. Funds for the programme are to come from international donors (following completion of a recent ‘World Bank Tourism Infrastructure Plan’ and a ‘European Union Tourism Master Plant plus private sector investments and Government funds. Features of the plan include new roads, upgrading of seven airstrips, the development of a new ‘Southern Circuit’ (Selous – the largest wildlife reserve in the world – Mikumi, Ruaha, Udzungwa, Katavi and Gombe Stream) by construction of tented camps and small lodges rather than big hotels, special interest holidays such as game fishing in the Pemba Channel and Mafia Island, bird watching in the Usambaras, historical tourism (including extension of the Livingstone Museum in Bagamoyo, a new School of Tribal Art there and greater accessibility to the caves with prehistoric paintings and the gorge where early human remains were found. But critics at the meeting questioned whether it would be possible to control the numbers, One speaker pointed out that Ngorongoro was already catering for 50 vehicles a day and yet a new Sopa Lodge and new Serena Hotel were being built. In Zanzibar hotel construction had “gone berserk”. At a Britain- Tanzania Society tourism seminar held on March 23 one speaker attacked the whole idea of Third World tourism – it led to neo-colonialism, local people did not benefit enough, it destroyed the natural environment, led to prostitution etc. Dr. Ngasongwa, at the Royal Geographic Society, admitted that, as a result of inviting the private sector to develop tourism, there had been overdevelopment but stated that the government was now introducing a moratorium on the development of hotels and lodges serving the Serengeti National Park and the Ngorongoro crater and that all future developments would be subject to environmental impact surveys. Tanzania had learnt by its mistakes. Tanzania Tourist Board Chairman Natim Karimjee added that the main problem he faced was ‘control’. The article went on to say that autonomy would enhance positive management and eliminate the need to depend on governments for subventions. Joanna Lewis writing in AFRICA ANALYSIS (January 29) about the UN observers in Tanzania’s recent elections analysed what she described as ‘this under-funded and poorly-managed UN operation …. Could 200 observers seriously be expected to break the historical links between the ruling party and the state?’. There could be no greater symbol of the contradictions and confusions surrounding the continuous donor policy of democratisation of Africa, she wrote, than the international community’s involvement in the Tanzanian elections. They had left in their wake a ‘trail of tension and cynicism1. The UN monitoring had been a ‘charade8. The writer felt that donors might now be about to cool their passion for multi-partyism and quoted a joke made by Mwalimu Nyerere to a British Conservative MP who was an observer on election day – that there was more than one way to maintain a one-party state. The writer said that Mwalimu now had another – to make sure that you had UN observers at your multi-party elections! ‘This sort of activity is not exactly on the syllabus at the Sokoine University of Agriculture’s Veterinary Faculty’ wrote Margaret Cooper in the September 1995 issue of VETERINARY PRACTICE but, she reported, not long ago four intrepid Tanzanian veterinary students and an English medical student risked all to rescue some tortoises and terrapins from a very hungry crocodile and then helped to translocate the crocodile to the Mikumi National Park. The rescue arose from a request by the Ministry of Natural Resources to deal with a collection of reptiles at an ~frican National Congress (ANC) camp which was to close imminently. Several visits were made to the camp to assess the collection which comprised a dozen tortoises, two leopard tortoises (Testudo pardalis) and ten Bell’s hingeback tortoises (Kinixys belliana) plus about ten terrapins and a Nile crocodile. …. some tortoises had been mutilated by the crocodile and the shells were repaired with car body filler or with putty …..
‘Mkapa is on the right track’ according to a recent editorial in Ugandars NEW VISION at the time when the President was bringing together the quarrelling leaders of Kenya and Uganda at the beginning of the year. The editorial went on: ‘Everyone in East Africa has very high hopes of President Mkapa because of his idealistic and untarnished image. He is right to lay such emphasis on regional cooperation because it is undoubtedly the key to the survival and growth of the African continent. We wish President Mkapa every success in his endeavours’ (Thank you Margaret Snyder for sending this news item from Uganda – Editor). The TIMES OF SWAZILAND (December 19) reported that a Tanzanian national had been arrested at the Swaziland – Mozambique border post at Lomahasha carrying 169 Mandrax tablets worth hundreds of thousands of Emalangeni (Swazi currency). This was the only border post where there were sniffer dogs trained to detect drugs. Forty-five years ago The Tanganyika Wattle Company (TANWAT) established a sustainable forestry business near Njombe for the extraction of tannin from the bark of the wattle tree (Acacia mearnsis) which is used for tanning leather. But, as the December 1995 issue of CDC MAGAZINE reported, the demand for tannin has gradually dropped. Activities were therefore diversified first into arable cropping, then into irrigated tea and in 1995 into a new 2,500 kW power station to use up half of TANWAT’s waste wood. By May 1995 TANWAT was able to begin exporting electricity to Njombe and its environs. ‘There are two groups of street children; the ones on the street who usually keep family ties and the children of the street who often get involved in anti-social activities’ – so wrote Sister Teresa, a Malawian Missionary Sister of our Lady of Africa in the April-May 1996 issue of WHITE FATHERS – WHITE SISTERS. She went on to explain how she got to know them. ‘When I found them playing cards outside Mwanza Hotel or in the market I joined them; I sat down with the bigger boys while they were smoking ‘bhang’ (marijuana) or drinking ‘gongo’ (alcohol); I have been in bars at night and found some of the young girls getting drunk.. . . .some of the boys come to our house for knotting, card making, watching videos….some of them go to sleep, because for once they can lie down without being harassed by the police or the ‘Sungusungu’ (traditional defence groups). Building relationships with the street girls is not that easy …. they want a quick way of getting money.. . .The streets of Mwanza are for me like pages of Scripture from the living context of life. It is like a sacred ground where I meet Christ in different forms. He calls me to live more closely with him and with his favourite ones, the poor, the street children and to know him more intimately through real live relationships with them’. The JOHANNESBURG STAR (January 6) reported that proposals have been made for a group of Tanzanian and other police officers to be trained in South Africa and then return home with Labrador and German sniffer dogs to assist in the fight against drug smuggling. as ‘Europe’s Most Informed Black Magazine’ and addresses itself particularly to the refugee and exile African community, has reported that, in order to stem the increasing number of bogus Tanzanian asylum seekers arriving in Britain, the British Home Office now requires all Tanzanian nationals travelling to Britain to have a visa. The number of asylum seekers, excluding dependants, from Tanzania has risen from 107 in 1994 to 1,250 in 1995. (British people travelling to Tanzania also need a visa. The high cost (f 38) corresponds to the very high cost of the visa needed by Tanzanians coming to the UK- Editor). The governments of Tanzania, Uganda and Kenya have agreed plans to launch large numbers of weevils later this year to attack the Water Hyacinth (Eichhornia crassipes) which is clogging up Lake Victoria. The weevils eat the leaves while the larvae chew into stems and crowns. But, according to the NEW SCIENTIST (April 6), experience with the weevils in Papua- New Guinea, indicates that they can take up to ten years to make a significant impact. TA has also been informed by Mr John Mole of TANNOL HOLDINGS, which is running an international research project on the relationship between Bilharzia-carrying snails and the water hyacinth, of a proposal being made for the hyacinth to be used as cattle fodder at a site 30 minutes from Mwanza. BRITISH OVERSEAS DEVELOPMENT has been reporting on the views of a group of Tanzanian students who visited Britain under the link arrangement between Shambalai School in Lushoto and St. Bedes School in Redhill, Surrey: – ‘Families are very different. In Tanzania the women and the girls do the cooking. Here, even the fathers cook for their children. But people here are so busy they don’t even have time to talk to each other8 – Daniel Herman. – ‘Pluses include the beautiful houses and the food (chips, chicken and beef)’ – Sylvia Denis. – ‘The visit to the car factory was best. Other likes included the air conditioning, the food, TV and British family life. But some of the skirts are too short’ – Hyasinta Lucas. Recalling the setting up by parliament in April 1995 of Tanzania’s first Marine Park in Mafia island, an article in AFRICA – ENVIRONMENT AND WILDLIFE (November -December 1995) explained that Mafia was one of the most biodiverse spots on the East African coast. With its spectacular coral reefs, seagrass beds, intertidal flats and nearby islets, the park included major breeding and nursery grounds for many marine species. Islanders would continue to live in the park but most of the area would be a ‘regulated use zone’. The coming year would see the design of World Wildlife community development initiatives and an ecological monitoring system. From a dusty outpost for early white hunters, Arusha has developed into an international centre demanding appropriate facilities for a population growing in sophistication. It already hosts the Eastern and Southern African Management Centre (ESAMI), the Centre for Integrated Rural Development in Africa (CIRDAFRICA), the Pan-African Postal Union (PAPU) and the Commonwealth Health Secretariat for East Africa. Now it is acquiring the United Nations International Rwanda Tribunal with hundreds of new spenders in the form of lawyers, journalists and investigators and the revived East African Cooperation Secretariat. Already also the town has three modern casinos, three new entertainment and night spots, more than ten tourist class hotels. New developments expected or just recently opened include the 500-capacity ‘Hotel 77 Maua Nyama Garden’, the multi-million shilling “Mike’s Jointr which straddles the Themi River, the ‘Soweto Garden’, ‘Johnson’s Corner’ which is under construction along Nairobi Road, and the futuristic ‘African Cultural and Heritage Centre’ along Dodoma Road. Arusha has also launched its own FM radio station and a tabloid newspaper – the EAST AFRICAN. This is how the Tabora Beekeepers Cooperative was described in the Spring 1996 issue of QUARTERLY RETURN, the Newsletter of Shared Interest Society Limited, The coop was said to have been started by a Roman Catholic priest in the 19609 and now has 2,500 members. In the rainy season the beekeepers hoist their hives up in the trees. Harvesting can be hazardous but it has been made easier by plastic buckets provided by Traidcraft which buys the honey. The coop has helped in establishing a number of primary schools, a clinic, a bus service and even a social centre where honey wine is sold to make more money. AFRICA TODAY (March/April 1966) reported that immigration officers barred 27-year-old Tanzanian Abdul-kader Shareef from Britain, apparently because they found a letter on him asking a friend in London to help him get a job. Twenty nine years later, Dr. Shareef was given VIP treatment on his return to take up his appointment to the Court of St. James as his country’s new High Commissioner in the UK. A GEMINI feature published in an number of newspapers including the Barbados SUNDAY ADVOCATE described the controversy which had arisen following the recent Miss Tanzania contest. The winner who had worn a swimsuit at the contest had subsequently been expelled from her secondary school following protests from traditionalists to the effect that it was immoral for a father to see the thighs of his daughter, that White people were bringing an obscene culture into Tanzania, that the body was ‘God’s house’ and that it was sinful to turn it into a commodity. Others countered by saying that many traditional dances were performed with bare breasts, that no one complained about the wearing of swimming costumes for swimming, that boys exposed their thighs in boxing and why shouldn’t girls be treated the same. The Headmaster of the girl’s school said that the girl had been expelled because she had played truant in order to take part in the contest. Taking up the story NEW AFRICAN (February) reported that the lady in question, 19-year old Emily Adolf Kailio, went on to take part in the Miss World Competition in Sun City (some call it Sin City) in South Africa but did not get into the finals. About 40% of the gold mined in Tanzania is recovered through a process using highly poisonous mercury. Small scale miners have been evaporating into air tons of mercury. The Tanzanian environmental magazine AGENDA in a recent issue reported that Dr. G Njau of the National Industrial Research Development Organisation (TIRDO) assisted by Mr A Itika, Mr L Rweyemamu and Prof. C Migiro of the Institute of Production Innovation (IPI) have designed, fabricated and tested a retort to recover mercury. It has air-cooled condensers, weighs only 2.4 kgs and is capable of recovering 99.6% of the mercury used during amalgamation with gold. These scientists, who were joint recipients of the 1995 ‘Tanzania Award for Scientific and Technical Achievement’ (TASTA), are looking for an entrepreneur to produce the retorts on a commercial basis. ‘I got through about 800 trees, 50kg of nails and a crate of beer a week.. .We used local materials – bamboo andeucalyptus trees and I salvaged cast-iron pipes from a disused tin mine as culverts … with these very simple materials we built food distribution and registration centres and emergency shelter’. This was the way in which Ms Jo da Silva of RedR (Registered Engineers for Disaster Relief) vividly described in the December 23/24 1995 issue of THE STRUCTURAL ENGINEER how she had arrived in Tanzania at ten days notice to help tens of thousands of refugees from Rwanda who had themselves arrived suddenly in Tanzania in April 1994. Warehouses had been imported from Norway – they required ‘creative thinking’ when some parts were found to be missing.. . (Thank you Roy Galbraith for sending this item – Editor). Although the first Tanzanian soap opera began only in April last year Tanzanians are lapping up the increasing numbers of soap operas with the same enthusiasm as everywhere else according to NEW AFRICAN (February). The man who is doing everything from editing the scripts to shooting the film is Sayed Mehboob or MEB as he is better known – the editing supervisor of Dar es Salaam TV. And one of the main reasons for the success of the programmes is that they are in Swahili. Most people have difficulty in following imported soaps. Kipigo cha Mke (Wife beating) is about an old Casanova who picks up beautiful young girls; Mtoto wa kufika (The stepchild) is about an overworked and frequently reprimanded stepchild called Siyawezi; Husada Mbaya (Jealousy is bad) features a student about to leave for Europe. This is how TANTRAVEL – Tanzania’s Travel and Leisure Magazine – described recently the Dar es Salaam Botanical Gardens and National Museum. The gardens were established as experimental gardens by the German colonial administration in 1893 and originally stretched from the present built-over plots around the fifth hole of the Gymkhana Club Golf Course through the Ocean Road Hospital grounds and the area surrounding the present State House. In July 1914 a mammoth Trade Fair and Agricultural Show was held in the gardens but during the First World War some 140 species of plants and shrubs were destroyed to facilitate the digging of trenches. In 1941 a museum was opened as a memorial to King George V who had died in 1936. The popular Zairean singer Dr. Remmy or Sauti ya Mnyonga (Voice of the poor) who has made his home in Tanzania, has changed, according to the January issue of NEW AFRICAN. He used to sing about government corruption and inefficiency and praised opposition leader Augustine Mrema. Then, after a spell in Britain, where he performed with a bare torso wrapped in nothing but an animal skin, he returned to Tanzania and started playing his music at CCM election rallies wearing three-piece suits. He backed Benjamin Mkapa in the presidential race. ‘The hippy turned square; the maverick became respectable’. Some people were said to believe that the change was linked to his fear of being deported as he had overstayed his residence permit in Tanzania. On December 9 1995 in Kampala the Zanzibar team scored a historic victory in the East and Central African Senior Soccer Challenge by beating the Uganda Kobs 1-0 and taking the cup for the first time. The Zanzibar team had earlier won matches against Rwanda 2-1, and Ethiopia 5-4 after a penalty shootout. They had been beaten by Kenya 0-2. Zanzibaris forgot about politics briefly when the victorious team arrived home to a massive welcome. Each of the 18 players was promised a Shsl.2 million motor cycle and President Amour awarded Shs 1 million each to goalkeeper Rifat Said and striker Victor Bambo for their outstanding performances. And then, on January 6 Tanzanians were celebrating again. Simba Sports Club retained its East and Central Africa Soccer Clubs title by defeating, with difficulty, the Rwandese Patriotic Army team by 1-0. British soccer star John Fashanu visited Tanzania in February as a UNICEF Ambassador for the AIDS Awareness Campaign and received considerable publicity. One of his first appointments was at the Karume Stadium where he officiated at a street children’s football match. Later he said that he wondered why Tanzania, with a population of 28 million, failed to feature in the African Cup of Nations final in South Africa. Refugees in Ngara District registered a population growth rate of 6% between June and December last year, a figure said to be the highest in the world; this compares with the figure of 2.9% in the rest of Tanzania. 6,000 Babies were born at the Kasulo camp where there are 436,000 refugees. The camp has well established medical services – Daily News. Scientists have identified a virus that causes measles in humans and distemper in dogs as the virus which caused the death of about 1,000 lions, about a third of the lions in the Serengeti in 1994. Uncounted hyenas, bat-eared foxes and leopards were also affected. One way in which to avoid similar problems in the future is the inoculation of dogs against distemper, a programme which has now started – East African. Fifty one people died and 416 others were injured in different traffic accidents in Dar es Salaam between January and March this year according to Police Commander Alfred Gewe. A total of 6,510 motor vehicles were impounded out of which 3,819 were the city commuter buses known as ‘dala dala’ in connection with various traffic offences. Drivers and conductors of the impounded vehicles were fined a total of Shs 113.8 million. Police had also netted 332 pirate taxis between January and March this year – Daily News. The new South Africa/Uganda/Tanzania owned Alliance airline has floated a proposal to merge with Air Tanzania and Uganda Airlines. It has pointed out that both airlines are earmarked for privatisation and that there was no hope or future for small national airlines – Daily News. A ‘Media Council’ under the Chairmanship of Professor Geoffrey Mmari has been set up to deal with complaints against the media. Members include Messrs. Joseph Masanilo, Chief Information Officer, British Council, Jenerali Ulimwengu, Editor of ‘Mtanzania’, Anthony Ngaiza, Editor ‘Majira’, Joseph Warioba, former Prime Minister and members of other political parties.